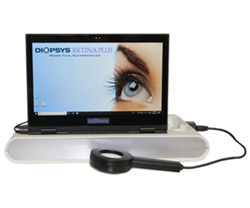 The Diopsys® Chromatic Flash Vision Screener is a simple-to-use and easy-to-integrate protocol within the Diopsys® ffERG / Full Field Electroretinography module. In diabetic retinopathy, we know functional changes will likely happen before structural changes, and to now have the ability to measure retinal function via this new test from Diopsys is truly a game changer. Diopsys Inc, the world leader in modern visual electrophysiology, announces the release of the Diopsys® Chromatic Flash Vision Screener, a new screening protocol designed to detect early retinal function changes in patients with diabetes. Recent epidemiologic data suggest that the prevalence of diabetes has increased significantly over the past two decades and that it will continue to rise in the future. Although it is commonly associated with systemic complications, diabetes can also affect the blood vessels in the eye leading to increased vascular permeability, putting patients at risk for developing microaneurysms, hemorrhages and hard exudates. The more advanced stages of diabetic retinopathy (DR) are associated with fibrosis and retinal ischemia, which may lead to the development of neovascularization. Fortunately, evolving treatment standards in DR have proven highly successful at arresting the disease process, but intervention is most successful when the disease is caught early. Recognizing the signs on clinical examination or with imaging, however, is challenging, and many cases are identified only after permanent damage has occurred. The Diopsys® Chromatic Flash Vision Screener helps address the unmet need for early recognition of retinal function changes related to DR with this new easy-to-use in-office screening test. Using red-on-blue flash electroretinography (ERG), the Diopsys® Chromatic Flash Vision Screener records the electrical potential of the retina to provide quantitative measurements of retinal function. Results are then analyzed against healthy reference range data to help the doctor understand the probability of the patient developing retinopathy. The protocol is part of the Diopsys® ffERG / Full Field Electroretinography module and is compatible with all new Diopsys® platforms. “The Diopsys Chromatic Flash Vision Screener is an exciting advancement in patient care that allows non-dilated testing of diabetic patients to help screen for the earliest signs of pathology. In diabetic retinopathy, we know functional changes will likely happen before structural changes, and to now have the ability to measure retinal function via this new test from Diopsys is truly a game changer,” said Nate Lighthizer, OD, FAAO. “It has been very useful as a screening test in our diabetic patients without retinopathy to help guide our management options and follow-up based on the results. The OCT, a structural test, has been utilized as a screener for some time, and this new test from Diopsys brings us the ability to also use function as a risk indicator." To introduce the new screening test, Dr. Lighthizer will lead a presentation, "At-Risk Patients: Screening for and Tracking Diabetic Retinopathy," on Thursday, November 8th during Academy 2018 San Antonio, the annual meeting of the American Academy of Optometry. More information about the Diopsys® Chromatic Flash Vision Screener may be found on the company’s website. As the world leader in modern visual electrophysiology, Diopsys, Inc. (http://diopsys.com/) has done more than any other company to advance the use of electroretinography (ERG) and visual evoked potential (VEP) in the eye care practice. The company’s unique, patented technology provides eye care professionals with objective, functional information about the health of the vision system to aid in the early detection of vision disorders, and post-treatment tracking for enhanced patient management.